As mentioned in the June newsletter, we will be CLOSED Monday, July 2nd through Friday, July 6th for vacation. 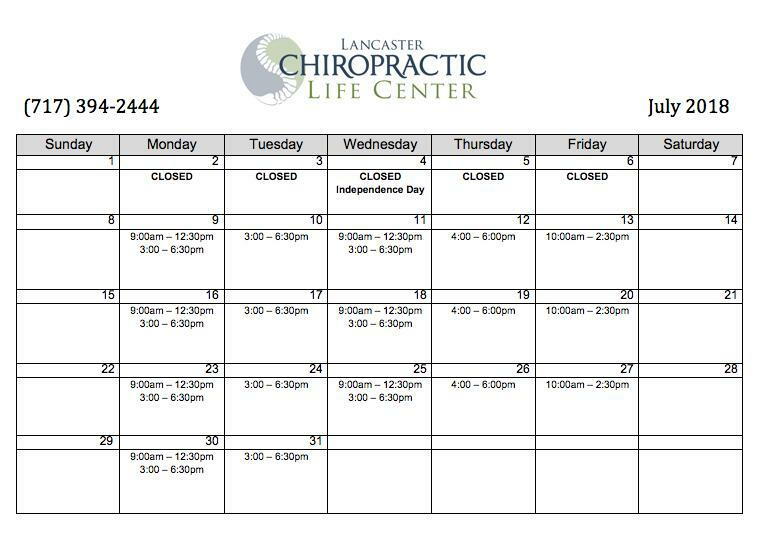 Please make sure to stop in and get checked the week prior to closing, as we will not be back in the office until Monday, July 9th. We wish you all a wonderful holiday week! Emotional health is also dependent on being connected, both within yourself and to others. A strong, conscious inner connection is usually reflected in fulfilling outer relationships – and the more relationships in your life, the more happiness, joy, hope, optimism, and vitality you will have; the healthier and longer you will live and the quicker you will recover from physical and emotional traumas and illness. An emotionally disconnected person holds pockets of unresolved anger, fear, resentment, pain, or other negative emotions locked up within their body and mind. Whatever the cause (abuse, conflict, etc. ), trapped emotional energies prevent us from living fully in the present because some of our energy is still caught up in past traumas and fears that lead to chronic physical tension and emotional stress, which disconnects us from our deeper selves. In this dis-eased state, intuition is clouded, life’s purpose is confused, and there you may have difficulty forming healthy relationships. The common purpose of all spiritua l/religious practices is communion with your soul, the universe, the great spirit, the Creator, God, or whatever term you wish to use. When you are spiritually healthy, you are connected to the depths within you and the universe without. The more spiritually connected you are, the closer you are to love, energy, joy, vitality, and wisdom of your source. When you are spiritually connected, you are in harmony with your life’s purpose and meaning. You follow your heart, trust your instincts, and remain conscious of the powers that create reality at every moment. You experience greater sensitivity, inspiration, empathy, compassion, intuition, synchronicity, and meaningful unfolding in your life. Spiritually aware people speak of having “peak experiences,” of feeling deeply connected to the whole, or of communing with humanity or a loving presence. They feel joy, happiness, and peace in these states. The spiritually disconnected person feels separated from the love, energy, joy, and vitality of their source, and a harmful sense of isolation, loneliness, confusion, and fear permeate both mind and body. They are out of touch with their deepest needs and desires, their will to live is weakened and their purpose in life is clouded, lacking vision and meaning. Chiropractic has discovered a powerful “disconnection” within your nervous system called the vertebral subluxation complex. This physical condition interferes with the flow of energy and information from your source and can affect physical, emotional, and spiritual health. The result is dis-ease and miscommunication within the body, where you are less than whole, slightly dis-integrated, slightly fragmented. Chiropractors are especially trained to locate and correct or remove subluxations. Reconnecting to your inner healer is always my goal as a Chiropractor. Chiropractic care permits your bod y/mind to gently release old stress and trauma, allowing your powerful natural healing ability to flow again from source and begin reconnecting. This fascinating process can appear effortless or difficult and painful – often it is both. As we reconnect, locked energies may be released, painful memories revived, stored toxins stirred, hurtful experiences re-experienced. This process of reawakening is called retracing. As old energies dissipate, you become sensitive to the deeper layers of your beingness. As your spine and nervous system release stress, you begin to tune into deeper laws of life that guide you and become more sensitive to the unseen hand that is always directing you to greater wholeness, awareness, growth, and wisdom. The origin of Uncle Sam probably began in 1812, when Samuel Wilson was a meat packer who provided meat for the US Army. The meat shipments were stamped with the initials, U.S. Someone joked that the initials stood for “Uncle Sam.” This joke eventually led to the idea of Uncle Sam symbolizing the United States government.